Home / Flying Squirrels / Flying Squirrel #2 – Finals week. Our studious squirrel spent another night hanging out in the yard for final testing. FS2 hanging from the flagpole. The FS2 hardware is complete and this is the first “On the Air” outside using the 20m dipole antenna. 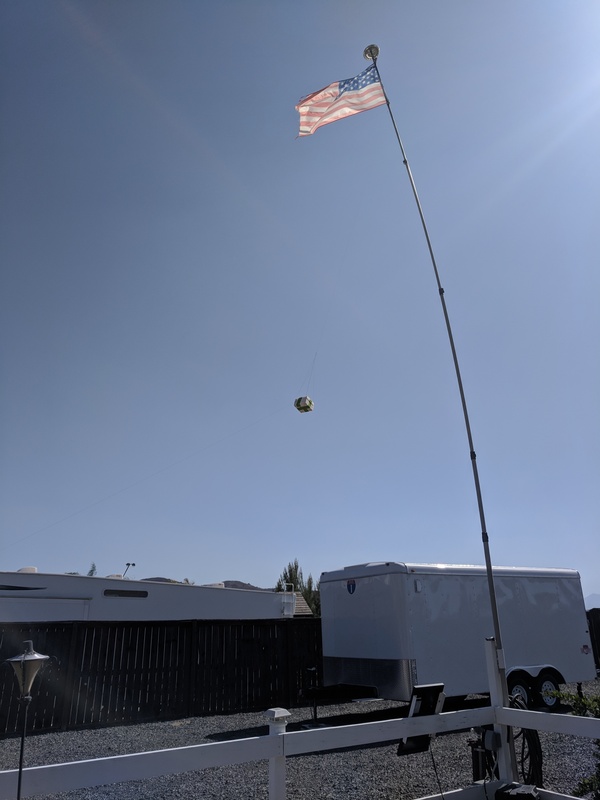 FS2 is hanging from a flag pole with the “balloon” end of the antenna suspended about 25 feet in the air. The dipole is 33 feet in length, so the bottom end is attached to a fence a few feet off the ground, pulling the antenna in to a sloped angle. FS2 also has the solar cell mounted on top of the Styrofoam payload container. #1 Can FS2 be heard by the WSPR network on 20m? #2 Will the solar cell recharge the battery after discharging overnight . Goal #1 was achieved. Despite being at ground level, and not so great band propagation conditions, the minuscule 20mw signal was heard by several stations during the test. During flight, at altitude, the reception should be much better because the signal won’t be blocked by ground clutter such as houses, walls, hills and mountains. How much power is 20 milliwats? A watt is a measure of electrical power (i.e ability to do work). You may be most familiar with the watt as a rating of how much energy a household light bulb consumes. Incandescent bulbs, in the US, are commonly in the range of 40 to 60 watts. A typical household 60 Watt bulb uses 3,000 times more energy than FS2 uses to transmit it’s telemetry data. Yet at just 20mw, FS2 has been received as far as 1465 miles away (2359Km) during this test. How far away will FS2 be heard during flight? Goal #2 – Heavy overcast clouds arrived overnight, so the solar cell is not illuminated with direct sunlight this morning. However, the test has been running for 17 Hours and the battery voltage is slowly charging from a low of 3.18v at dawn and has reached 3.22V (We need 2.9V or better to transmit). If the skies were sunny the battery would likely be recharging much faster. Clouds will not be an issue at high altitude as FS2 will be above the clouds for most of the flight. Prior prototype tests also indicate solar charging will work well. FS2 may not fly long enough to go though a complete discharge/solar charge cycle, but the solar cell may help in locating the squirrel when it returns to ground… if it is able to transmit from the ground. The FS2 scheduled launch date (5/19) is a week away. Much to do! Stay tuned!